Whoever booked Dan Savage for the 2012 American School Counselor Association Conference, "Be Brilliant," should, in my opinion, get an extra day off. Or perhaps a raise. Or, at the very least, an ice-cream cone. With extra sprinkles. I have somehow ended up in a life where I listen to a lot of speeches. As a child, my father was heavily involved in local and national politics. Before I was 16, I had been to more pancake breakfasts, summer cookouts, and fundraisers that involved some semblance of oratory than most people will attend in their entire lifetimes. Moving into adulthood, the context of the speeches may have changed, but the constancy of having them in my life remains the same. Some are good--I learn new things, perhaps even feel inspired to try something differently and step out of my comfort zone. Some lead me to say to myself, "Self, somewhere your life has gone off course. I'm not sure when and I'm not sure where, but it has landed you here, in this room, listening to yet another speech." Perhaps it is just one of the realities of being in a profession where you attend graduations, professional developments, and conferences on a regular basis. All this being said, it takes the intersection of the subject of the speech, the power of the speaker, and my emotional attachment to the topic to produce a strong reaction. All of these things came together in the keynote address this past Saturday evening. Since this original video went live, thousands upon thousands of videos have been posted to the site representing the widely diverse LGBT community, all with the hope of inspiring LGBT youth to stay with us to see adult hood and find happiness and even joy. 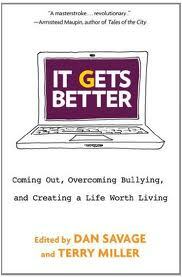 Dan Savage also spoke to the fact that many students are bullied for a variety of reasons in schools. However, many students who are bullied can go home to supportive families. In the case of LGBT kids, they may go from a hostile environment in schools to a hostile environment at home, as families can often struggle with accepting their LGBT son or daughter, especially if this goes against deeply held personal beliefs. Thus, these students are the most high-risk of all, because there is no safe space for them in their lives--neither school nor home. This is where we, as school counselors, can play a crucial part in advocating for these students and letting them know that there is at least one adult in their lives who will support them as they work through the issues at school and the possible issues at home. Acknowledge the existence of LGBT students. LGBT kids are in our schools. They're in our classrooms, they are in our communities. And they need support. Sponsor or support a Gay-Straight Alliance in your school. Dan Savage said that even if a student never attends a meeting, the mere knowledge of the fact that there is a GSA that meets regularly in the school can give them hope. Make it known that there are Safe Spaces in your school. One of the most visible ways to do this is to place a Safe Space sticker or poster in your office. As another counselor pointed out to me, the sticker is only a start--you must then follow through with unconditional positive regard (hello, Carl Rogers) and empathy for it to truly mean something. Anti-gay bullying makes the whole school unsafe. All bullying must be confronted. Think about this--what message is being sent if some bullying is allowed? It gives tacit permission that all bullying is okay. Anti-gay bullying can happen to students who do not identify as LGBT--they may simply be perceived, for a variety of reasons, as LGBT, yet suffer the same consequences. Work with your school administration and district to develop policies and procedures that make all bullying and harassment unacceptable. Don't forget the parents. The coming-out process is difficult both for the student but also on the entire family. Parents need our support, understanding, and resources as they work through this process with their children. A great outside organization to point them towards is PFLAG. You can find a local chapter through their website. As school counselors, we can be leaders within our schools--we can help to educate our school personnel, we can advocate for policy and procedural change, and we can be visible support to our LGBT students. Wouldn't it be wonderful if there wasn't a need for It Gets Better because things were great now? Also, I have written multiple blog posts about LGBT issues in school counseling and you can check out the resources under my Links and Books tab. Every year all of the counselors in my building do a "meet and greet" lesson with our new 9th grade students. They get to see where our offices are, we talk about graduation requirements, transcripts and grades, and let them know about the vast array of services we, as school counselors, are able to provide them during all four years that they are with us. As we are also trying to create a college-going culture, we ask them about their goals after high-school. We do these lessons in small groups, so the students are able to hear several of their peers' responses. Most of them state they are planning on attending one of the popular state universities here in Virginia--UVA, Virginia Tech, VCU, etc. A few years ago during this activity, one of my new students stated they were thinking of going to Northern Virginia Community College, or NOVA as its known in this region. Another student laughed at this answer, stating that "NOVA is a school for losers." It was at this point that I knew that we, as a school counseling team, had our work cut out for us. I think it is pretty well common knowledge at this point that in order to have any realistic fighting chance at economic security in your life, you need some sort of post-secondary education. However, as I've written about before, I think we need to continue to refine our definition of "college." College is not necessarily a four-year degree. There are many certificate programs and associates degrees that will train people for well-paying jobs and careers in a variety of fields. In fact, for many of these jobs a four-year degree may not be preferable over a two-year degree that really hones in on the skills necessary for that particular occupation. Further, if we look at six-year graduation rates from four-year colleges and universities around the country, it is clear that a large percentage of students will not be finished with a degree within that time frame, depending upon the specific school. In fact, in the United States, the average graduation rate at four-year public universities within four years is 31.3%, and within six years is 56%. That means that only a third of these students will have a degree in four years, and a little more than half within six years. Some students may be working full or part time while going through school and are thus taking classes at a slower rate than other students. Additionally, there are always going to be exceptional circumstances that might allow for some of these students who do not make it within six years. However, you have to begin to wonder if a four-year university was the best fit in the first place for many of these students, and did they have all the information necessary to make a "savvy" choice, as Mr. Carnevale asks? It can cost a lot less. Even if a student is four-year bound, the financial cost of attending a community college for two years and then transferring to a four-year college is going to be significantly less than doing all four years at a traditional university, public or private. For those families and students who are worried about future student loan debt (a very real concern right now) or about the strain of having to work full-time (as a student) or two or three jobs (as a parent) to be able to afford a four-year school, community college may be a strong choice at which to begin their college career. Every year I have students with academic profiles that would gain acceptance to good four-year universities who choose to do community college for two years in order to save money on their education. Some students are not yet ready to leave home. Parents, for the most part, know their kids pretty well. If you as a school counselor and they as a parent have worked just as hard to get a student through high school as the student themselves, then they may not yet be ready to leave home with all of that extra support and go away to a four-year school. If this is a student who continuously gets into minor trouble (cheating, fights, excessive partying, smaller community issues) then they may not yet be ready for the freedom of life at college. Some kids simply need another year or two of maturity and growing up in order to gain the skills necessary to manage both their academic and personal lives in a way that will give them a much stronger chance of success. Better to go to community college for a few years than go away to school, spend $10,000, and then be kicked out at the end of the year for academic or social reasons. Students need to build up their academic profile. We all have those students who figure some things out closer to the end of their high-school career than at the beginning. They have come to realize late that their grades and the classes they take really do matter. Community college allows them to start with a clean slate and to build up their academic credentials so that after a year or two they can transfer into a four year school, having proven that they are ready to take on college-level coursework. Four-year college is not for everyone, nor may it be necessary. As mentioned before, there are many occupations for which a certificate or a two-year degree may be all that is required before a student can move into a good paying job or begin a career. Not every student is going to be ready, at least at this time in their life, to do a Bachelor's degree. However, they do need to get some kind of post-secondary training, whether it is in auto technology, cosmetology, computers and information technology, or dental assisting so that they are then ready to go out into the world with some marketable skills. I always tell students and families that this doesn't mean that they will never get a four-year degree--it just may be that this is not the right time for them in their lives and they can always go back later. Students have absolutely no idea what they want to do. Part of what has always worried me about the six-year graduation statistics is that I fear that some of those students who may be on the seven or eight year plan began college with no earthly idea of what they wanted to study. This is very normal--I would wager that most 18 year-olds are unsure of what they want to be when they grow up. However, exploring a variety of fields is a lot less expensive at a community college than at a four-year school. It is possible that these students need a year or two of career exploration (perhaps even via a gap year) to get some idea of what area(s) they may want to study so that when they do finally attend that four-year school they are able to be focused and complete a degree within four to six years. Students had their heart set on attending a certain school but did not get in. We have students and families that really only want to attend a certain favorite school, and perhaps do not get into that college during the admissions process. Going to community college allows them a year or two to strengthen their academic credentials so that they can reapply and transfer in. It is important to check to see what partnerships or programs are available from your local community college that could assist you in helping students and families to explore whether it it is a viable option for them. For example, at NOVA there is a guaranteed admissions program which allows students, depending on their GPA, to graduate with an Associate of Arts or an Associate of Science degree and then be automatically admitted to the Virginia public school of their choice. Further, we have the Pathways to the Baccalaureate program that supports students in their senior year of high school who are looking to go to NOVA for two years and then transfer to a four-year school. The Pathways' counselor meets on a weekly basis with students in the program at their high-school, and then there is continued support for these students once they begin at NOVA. If you do not have these partnerships at your school, it may be worth teaming up with your local school counselors, administrators, community members, and school district to try to develop some programming. At my school, we have really come a long way in a few short years with taking away the stigma of community college as an option only for students who were unable to get into any other college. This has taken a lot of effort on the part of the school counselors and our amazing career-center specialist, but I really feel we have turned the corner. Now, many of our families see this as a strong option for their children for all of the reasons I've listed above, and it is viewed as it should be--a powerful stepping stone to a bright future of college and career. Judging by my completely unofficial tally of Facebook and Twitter, most schools are now out for the summer. My friends and colleagues, teachers and school counselors, are all reveling in having wrapped up their school years and are excited about their upcoming summer plans. Unless of course, you are me, in which case you still have a week left of classes and finals, and then graduation the following Monday. But really, I'm not envious or anything. No sir, not at all. However, even though you may be done with your official duties for the year, and even though you may have one foot (or maybe two) already on a beach or at a campsite, you're not quite finished yet. During the actual school year, we are usually running around at the highest rate of speed possible. We are implementing preventative programs, gathering data, and dealing with in-the-moment crises of all sorts, large and small. If we are lucky, we have some time to examine data on our programs and interventions to determine their effectiveness as well as to decide upon any possible changes for the next year. Usually, though, we have very few moments during the year to look back and really reflect upon what we have done, determine if it was effective, and what our goals might be for the next year and beyond. Remember graduate school? Ah, those halcyon days of yore. Reflection was mandated as part of the curriculum. Supervision, both at your internship sites and your universities, was an essential part of helping you to grow as a school counselor. Some of you had to write up case notes. Some of you had to journal about your experiences. Most of you had to have conversations with experienced professionals inside and outside of the schools on a regular basis that helped you to determine the effectiveness of your interventions and also assisted you in thinking about how you could change it here, tweak it there, or take it to a place of more depth. Once you finished your degree program, you were declared knowledgeable and sent off into the world, but those supports that helped you to look back on your work and examine it more closely may not have followed you into the professional arena. Thus, it becomes incumbent on us, once we are working in the schools, to make sure that we are including reflection as a vital part of our work. As mentioned before, during the year you have probably had some time to look back on your work on a micro-level: this program here, a classroom lesson there, a six session group in the middle of the year. Many of you trained in the ASCA Model have gathered data on your delivery services and have analyzed that information as each of your individual programs came to their conclusion. However, now is the time to take all of these mini-reflections and look at them in the larger, macro context of the entire school year. With the school year complete, you are now able to take all of the pieces of your year--groups, lessons, individual counseling, crisis interventions, career units, etc.--and fit them together to get a complete picture. Prevention: Most classroom lessons, large group presentations, and programming that has a set calendar date fall into this category. Many of your groups may also fit in here. First, on a micro-level, were each of these programs necessary? What was the impetus--school district or school mandate? Was there data that demonstrated the necessity of the program, or was there just a popular push to have it? After they were complete, did data (attendance, grades, discipline referrals, surveys, interviews, etc) support their effectiveness? If the answer is no, is this a program that should be continued? Altered? Timed differently? There is no point in continuing to invest your time and effort into a program that is not effective and for which there may not be a real demonstrated "need." If any of these programs did not have a great impact, it may be time to consider eliminating it, changing-it up, or moving it to a different time in the year when perhaps that particular issue is more prevalent and on the forefront of peoples' minds. Additionally, is it a program that is relevant to school counseling? If it takes up a lot of your time and yet falls into the category of non-counseling duties, perhaps it is worth having a conversation with your administration about it being given to another person or group, or whether there is a way to streamline it so that it has less of an impact on your schedule. Further, look at all of these on a macro-level. Do you find that there is a good spread of programs throughout the year, or are there times when you (and the students, parents, teachers, and administrators) are trying to deliver and support six different and time-consuming interventions over a two-week time span? It may be that this is unavoidable and that the programs are necessary within that window, but it is worth asking that question. Even if they are all important at that specific time, are you able to perform at your best if you are stretched that thin? Reaction: Here is where you want to examine those situations that just seemed to "pop" up as the year went on. You may have even chosen to run a group based on the growing needs of your students on a particular issue. As concerns about students came up, did the referral system within your building work effectively so that you were able to intervene? If not, what were some of the pitfalls? How could you make it better for the next year? As large crises came up, did you and the school team handle them effectively? Did you have a documented plan? Did you feel you had support from other staff within and outside of your school? What might you do differently next year to make it more effective? As you found that you needed to refer students and families outside of the school for additional help, did you have a referral list on hand that was helpful? Did you have relationships with some outside support practitioners to help make the transition smooth? Are there things you can do for next year to help make that process easier for you, your students, and their families? Looking back, are there issues that seemed to pop up time and time again? If so, would it be helpful to try to program a preventative lesson or presentation about that concern and collect data to see if it helped to head some situations off at the pass? Would it be helpful to program time in the year for a group on issues that seem to always come up--grief and loss, divorce, social-skills? Looking at it from a macro level, were there times of year where you seemed to deal with noticeably more crises or immediate issues (ex. before winter break, the end of the school year)? Can you free up some additional time in those periods knowing they will be busier? Relationships: How are your relationships with other counselors in your building or district? How are they with your administrators? How are they with the teachers, the students, and the parents? Oftentimes the key to your success is the strength of these partnerships with your stakeholders. What did you do well to help to build and strengthen your bonds, and did it pay off? Are there things that you might want to try to do next year to advance the communication between yourself and other members of your school community? Inviting parents in for coffees or teas? Setting up weekly or bi-weekly meetings with your administrator to share information about students and come up with intervention plans? Using your time in the hallways to get to know the teachers in your building a bit more? If you feel there is some part of your school community that you would like to know better, now is the time to consider ways to make that happen. You as an individual, both professionally and personally. Are you where you envisioned yourself being at the end of this school year? If so, how were you able to meet that goal? If not, was your goal realistic, and if it was, what prevented you from reaching it? Did you have to stay at work every night until six, seven, eight o'clock? Were you able to maintain an acceptable work/life balance? Looking ahead, do you see yourself wanting to take on more leadership within your school, your district, or at the state and/or national levels? Do you see yourself wanting to have more time for personal pursuits--hobbies, family, additional education? When work became stressful, did you have a self-care plan that adequately met your needs? Are there additional supports, either professional or personal, that you feel you need to put in place for the upcoming year? What further training or education would help you reach your individual goals? This last set of reflections is of primary importance, and, again, I feel we often gloss it over. However, it is vital to examine your job within the context of your entire life to see if it is falling into place in the way that you expected, or if there are steps that need to be taken to put it into the proper context for you. There may be things that you can do within your building or community to put your job into a place of balance, or there may be things you can do within your personal sphere that could also have a positive impact on achieving just the right note between work and life. Remember that self-care is an ethical mandate, and that you can only be effective in your work if you yourself are taken care of. Once you have taken the time to reflect on these ideas and examined all the data and information, you can begin to pull together your calendar and programming for next year. It is probably not realistic to think you are going to be able to change everything--I would recommend picking a few key things to focus on, change, or add, and allow those to be the goals for the year. Maybe you were unable to run any groups this year, so perhaps adding one for next year in an area of demonstrated need would be a great way to start? Maybe you want to examine an achievement gap in your building and help to facilitate an intervention, either on your own or partnering with other stakeholders? It is important, also, to take your reflections and put them into a context of those that are immediate goals/changes and ones that may be more long term. Perhaps you are interested in applying for RAMP, but doing it within a year is not going to work. However, you can take steps this year to begin the transformation process that might allow you to apply within two years or even three. Whatever your aims, taking real time to look constructively back on your year allows you to be proud of your successes and helps you to plan for the short and long term, both for your program as well as for you as a professional and individual.